The Red God Had The Earthquake Blues — But Now He's On A Roll! : Goats and Soda Every 12 years, the Nepali deity goes for a chariot ride so the faithful can pay homage and pray for a good harvest. He ventured out in April, ran into an earthquake and took a very long break. The Red God Had The Earthquake Blues — But Now He's On A Roll! The Red God is pulled through the streets in a 60-foot tower. 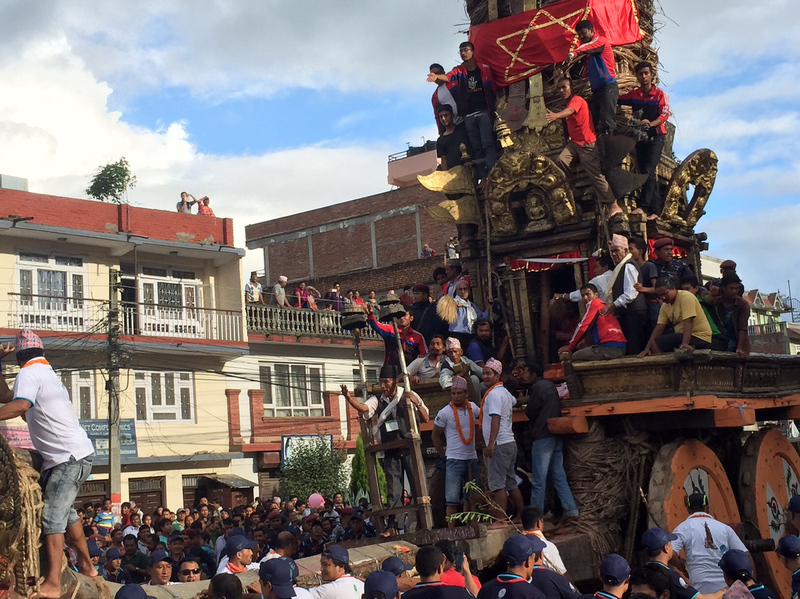 The Red God of Nepal is on the move again, riding in a chariot pulled by dozens of intoxicated men. The April earthquake slowed the god down and left him homeless, but there's no stopping a determined deity. 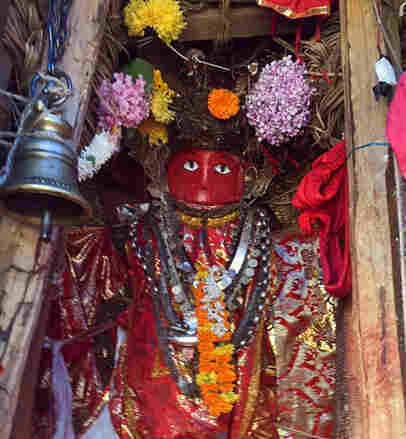 The Red God, or Rato Macchendranath, is both a Hindu and a Buddhist deity. He takes the form of a short wooden statue with a red face (it's an auspicious color in Nepal), freshened up every year with a new coat of paint. He's worshipped as the son of a demoness. He carries with him not only the promise of a good monsoon and good harvest for this country's many farmers but also good health and prosperity after a bitter and tough year — first a devastating earthquake and now more than a month of violent strikes that have paralyzed half the country and blocked all border crossings with India. In Nepal, the Red God has a yearly festival in Kathmandu's twin city of Patan and goes for a chariot ride every 12 years to his original temple in the southern farming town of Bungamati, giving lots of folks a chance to worship him. Astrologers set the date and plot the route. But this year, things didn't quite go as planned. The procession began April 23 and immediately had problems. The chariot's huge, hand-carved wooden painted wheels got stuck in mud ruts the first night. Along with the statue of the god, the chariot carries a vine-wrapped 60-foot-tall tower, known as a "rath," but the rath was leaning so steeply that the chariot stopped short of its destination the second day. Then on April 25 the earthquake struck. And the chariot — like much of Nepal — stopped. The Red God was left homeless, like several million Nepalis. He was kept in a tent pitched down the road from my house. The priests who live and sleep with him under the tent (with two armed policemen guarding them 24 hours a day) have been waiting for the astrologers to give the OK to move. When the decision was made to continue the Red God's journey, many people in Nepal saw this as a sign of hope and courage. Men ride with Red God, which is housed in the base of a 60-foot tower. Tuesday was the day, greeted with immense joy by thousands of pilgrims. But the journey is very different from the last one, in 2003. Twelve years ago, this area — my neighborhood — was mostly buffalo grazing fields. 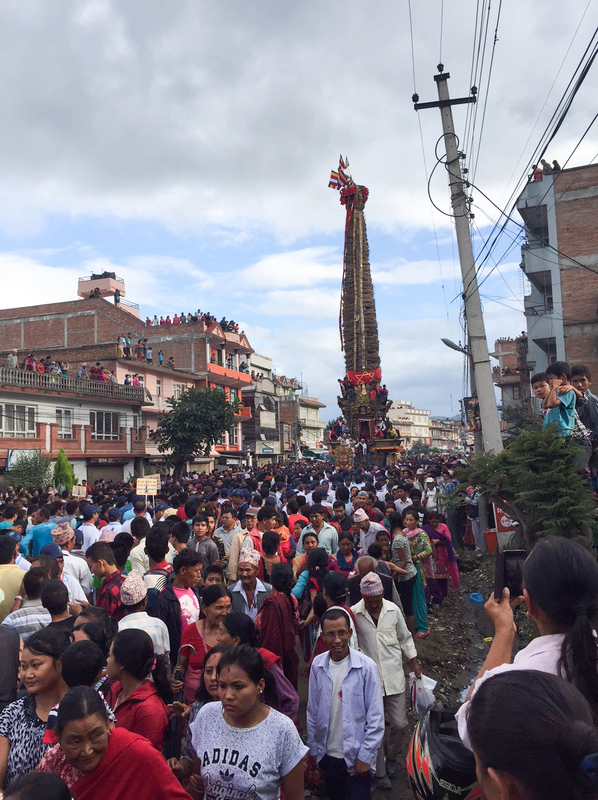 So the towering rath had no problem coming down the steep hills into Kathmandu. Today the city has five-story buildings, shops, markets and small businesses and spiderwebs of phone, Internet and electricity wires crisscrossing the now paved roads. The Nepal Electricity Authority came up Tuesday afternoon to remove all wires that crossed the main road, leaving customers without electricity or Internet for an indefinite period. The main roads were closed without warning, and locals had to just make do. It will take at least two days along some very steep roads and across a rain-swollen river (the chariot cannot be pulled across a bridge but needs to enter the river water) for the chariot and the god to get to Patan, where he'll start a monthlong tour through the narrow streets of the old city, stopping every night so devotees can come worship him. Only then, with the permission of astrologers, will he return to his home in Bungamati. If the word incredible could take on its original meaning, then the Red God would tell the story. Today, cymbals and drums entertained the throngs. Soldiers whose sole job is to guard the Red God and his fellow deities lined the side of the road. And there behind the dense, churning crowd moved the god and his chariot. The Red God himself sits in an altarlike chamber beneath the rath and above the wheels. On the golden head that emerges from the front of the chariot, a man in a white shirt, known as "the encourager," waved his arms and excited the crowd and wooed the hundreds of men to pull the ropes. "This is very good for all of us," said a 14-year-old schoolgirl in a blue and white uniform, two thick braids down her back and her teeth stained red with betel juice. "Maybe now the gods will make life better in Nepal after the quake." Like a wave, a roar rose up as the chariot jerked and swayed and churned forward along with the thousands of people surrounding it. The Red God was on the move.